Maintaining a good workout routine is not easy with all of life’s interruptions. What would be helpful is a 10 minute Yoga Energy Flow Booster. The shorter workout time would be best to do in the early morning hours when everyone else is asleep and before you start off your busy day. You may be interrupted to answer a phone call, by a family member (like your child) who needs your attention and also you may get an urgent request to run a business errand that you had not planned for. All these things interfere with keeping up with your workouts. This inability to finish your routines uninterrupted could impact your ability in achieving your body goals in the long run. There is one yoga routine that is easy to follow and can quickly help you achieve your workout goals with ease. 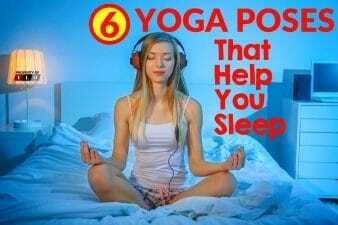 To be fully prepared, consider sleeping ready for the yoga routine. Meaning, go to bed in your workout gear. That way once the alarms ring, all you will do is head to the exercise room to do your yoga workout. The yoga routine takes only ten minutes to complete which is enough time for a good workout and to get your juices flowing. 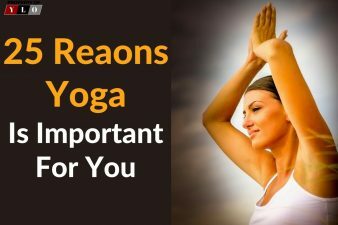 How Does Yoga Energy Flow Work? The yoga focuses on the entire body whereby it works by strengthening the muscles and leaving you feeling fresh and relaxed. The exercise prepares you for a long day ahead since it helps you stay comfortable and active as well. The yoga routines take part in 5 pairs which are supposed to run for about 10 minutes in total. Every pair of routines run for one minute, but once you are done with the five pairs, you have to repeat all the methods for another turn to complete the ten minutes workout. These are the first two yoga exercises that you should start with to get you energized to carry on with others. 1. Get in standing position and reach your right hand over the ear, then bend sideways and lower your left arm down your left leg. Return to your usual position and repeat the same process using the other side. 2. Put your legs apart and make sure the toes are turned out and side your tailbone while you do squats. Make sure to pull your hands towards your heart area and also press your elbows against the inner parts of your thighs. Then go back to the standing position. Repeat these two exercises for one minute before you move to the following pair. 1. Stay at a dog position with both your hands and the shoulders positioned in width apart. Then tailbone up in the air and make sure to press the chest back towards the thighs and also push the heels towards the floor. 2. The next exercise requires you to tighten the core area and then pull your body in a straight line such that the shoulder should be above your waist Also ensure the body is formed in a plank form. Stay in this position and hold your body tightly for a minute as you inhale and exhale. Press back to the post and repeat the two exercises for a minute. 1. Start by putting your body in a crescent lunge form. Step the left foot out of the mat and place it back again. Reach both your hands straight and then put your right knee to a 90 -degree position. Repeat the same using the other leg. 2 The next step requires you to rotate the left foot and put it in a straight line with the right foot. For this form to work, you need to deepen your stance slightly, so you can be able to get a stable form. Then spread your arms and reach out wide for warrior 2. Note that the two exercises should be conducted as you alternate both legs. 1. Stay in a chair form by bending your knees and then tailbone your feet heels. Extend both hands towards the front area alongside your ears and make sure to keep your core tightened. Stay in this form for a few seconds and inhale then exhale. 2. Still, in the same chair position, bring your hands together and hold them in a praying position. Rotate at the ribcage and place the right hand’s elbow over your left knee inhale and exhale as you do the same by using the opposite sides. Repeat the two exercises in a minute. 1. Stand in a seated position and reach both your arm from behind and make sure your fingertips are touching. Keep the body and the hip width apart exhale slowly as you lift your hips high, relax your head back into a reverse position and make sure to form a tabletop position. Inhale and exhale. 2. Sit down on the mat and keep your core engaged. Extend both your legs straight up in front part and reach your arms straight alongside your legs and form a boat like position Stay in this position and still ensure your core is engaged. Repeat these exercises for another one minute. After you are done with the five exercises, drink a lot of water and get ready to start your day. 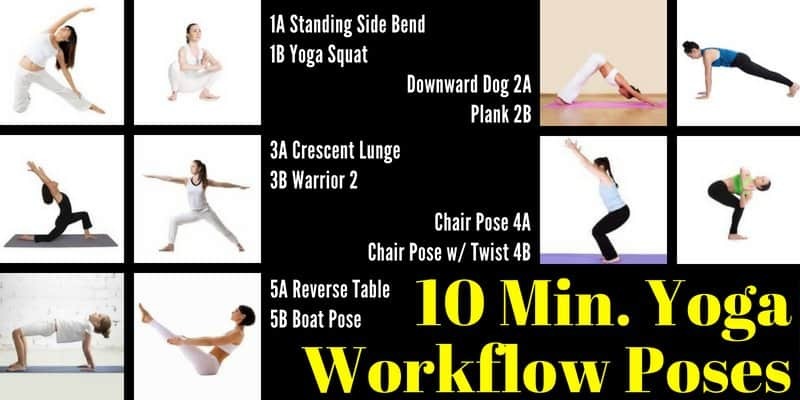 It is that easy and quick to do the 10 Minute Yoga Workflow Energy Booster Routine. Let us know if you have tried any yoga energy flows and how it is working for you. Our readers all are looking for information on these workflows.